The developments at Ola clearly hogged the limelight during the week, with Tiger Global’s managing partner Lee Fixel stepping down from its board, triggering speculations of a partial stake sale to its largest investor, Softbank. Nandan Nilekani’s move to commit half his wealth to philanthropy through The Giving Pledge, an elite network of the world’s wealthiest individuals, was also hailed as yet another feather in his cap by industry veterans. The week also so Inmobi co-founder Amit Gupta, moving on with the launch of an IoT-based bicycle sharing startup Yulu, while Chinese handset and tech major Xiaomi committing $1 billion to invest in Indian startups. Flipkart, too, reaffirmed its earlier intent to foray into financial products, including the possibility of selling insurance on its platform. This apart, fundraisings and acquisitions at the startup street continued with Portea leading the pack with a $26 million Series- C round, and online home decor company Homelane buying out Capricoast. Tiger Global’s managing partner Lee Fixel stepped down from the board of taxi hailing aggregator Ola earlier this month. While the company did not respond to queries on Fixel’s move, it has, however, thickened speculations of the PE firm’s dwindling stakeholding in the company. The Economic Times reported that Ola’s largest investor, Japan’s Softbank Group Corp, may pick up half of Tiger Global’s 15% stake worth $600 million, given Ola’s current valuation. However, in May, a report by technology news website Factor Daily had said that SoftBank, with a stake of about 40%, was in talks with Tiger Global to buy its holdings for $700 million. An industry source, with direct knowledge of the developments, said that SoftBank currently holds around 24-25% in Ola, while Tiger Global owns 12%. So, a deal, if it materialises, would still take SoftBank’s estimated stake to only around 30%. Meanwhile the company’s fair valuation advisor has projected that Ola, which made estimated net losses of Rs 2,998 crore is likely to touch Rs 5,996 crore in net profits, in three years. Ola is also likely to turn profitable in two years, sharply arresting its operating losses to Rs 989 crore in 2017-18. It is also aiming to post an operating profit of Rs 950.5 crore in 2018-19. These projected figures were part of a valuation report by audit firm Jain Ambavat & Associates. 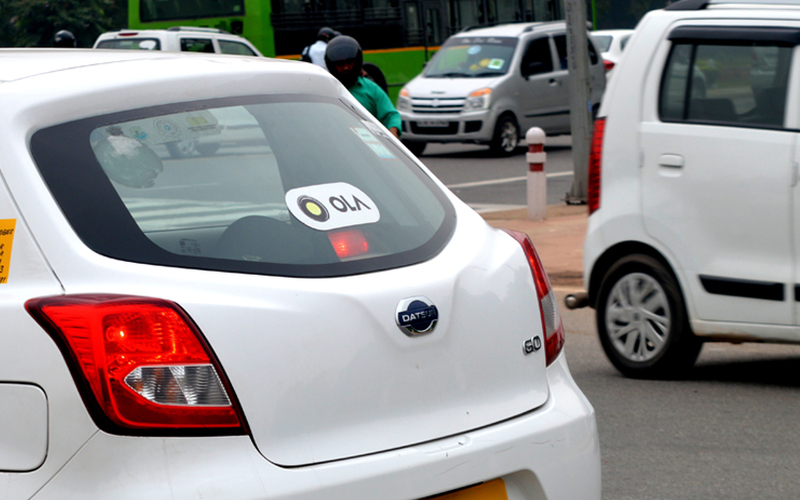 Ola had disclosed the report as part of its regulatory filings following the $1.1 billion funding that it had raised in October from China’s Tencent and SoftBank, besides others. Going by the projections, Ola, which had made an estimated net loss pf Rs 2,988 crore in 2016-17, is projected to post a net profit of Rs 3,023 crore in 2019-20 and Rs 5,996 crore in 2020-21. The audit firm had arrived at the projections on the basis of Ola’s audited financial statements for 2015-16, provisional financial summary for the period ended 28 February 2017, financial projections from 1 March 2017 to 2021, and inputs provided by Ola on its business operations as well as secondary research. The report puts Ola’s valuation at Rs 25,615.92 crore, or $3.95 billion, which translates into an over $5-billion valuation after the October fundraise. Pioneered by Microsoft founder Bill Gates, his wife Melinda Gates, and billionaire investor Warren Buffett in 2010, The Giving Pledge has seen as many as 171 wealthy philanthropists across the world sign up for the cause. Wipro chairman Azim Premji, Biocon chairman Kiran Mazumdar-Shaw and Sobha Developers’ chairman emeritus PNC Menon are also part of the group. A first-generation entrepreneur, Nilekani is estimated to be worth $1.7 billion, deriving most of his wealth from Infosys stocks. Meanwhile, Airtel promoters, the Bharti family, has also pledged Rs 7,000 crore (around $1.1 billion), or 10% of its wealth, to support activities of the Bharti Foundation, the Sunil Mittal-led group’s philanthropic arm. This includes a 3% stake of the family in telecom operator Bharti Airtel Ltd, the parent company, Bharti Enterprises Ltd said in a statement. Ad-tech firm InMobi’s co-founder and president, OEM and telco solutions Amit Gupta stepped down from his executive role to launch Internet of Things-based bicycle sharing platform Yulu, where he will take charge as the CEO. Gupta’s departure is the second such move by a co-founder of the first Indian startup to be recognised as a unicorn, in the past five months. Gupta said he would continue to be associated with InMobi as a co-founder, while building his new venture. Earlier this year, co-founder and chief technology officer Mohit Saxena had also quit the company to start a new venture. Chinese electronics maker Xiaomi Corp plans to invest $1 billion in 100 Indian startups over the next five years in a bid to create an ecosystem of apps around its smartphone brand, said CEO Lei Jun. In an interview with Mint, Lei said that Xiaomi and its sister firm Shunwei Capital has already invested in six Indian companies, including Hungama and KrazyBee. He said that Xiaomi will invest in businesses that include content, hyperlocal services, fintech, mobile phone repair and manufacturing. Homegrown e-commerce major Flipkart will soon start selling insurance products on its platform, in line with its earlier intent to foray into financial products and services. Flipkart will initially sell products in general, life and health insurance, and later venture into other categories such as motor insurance, company filings revealed. The company will launch the products after obtaining a regulatory approval from the Insurance Regulatory and Development Authority. IRDA regulations allow Flipkart to tie-up with up to three insurers under each insurance category. The e-commerce major will facilitate and provide end-to-end transactions, except underwriting, including discovery, payment, delivery and after-sales services. Health Vista India Pvt. Ltd, which provides home healthcare services under the Portea Medical brand, has raised $26 million (Rs 168 crore) in a Series C round led by new investors Sabre Partners and MEMG CDC. The funding announcement comes a few months after VCCircle, had reported that the company was in advanced talks to raise $25 million in a Series C round from three potential investors. London- and Mumbai-based Heckyl Technologies Pvt. Ltd, Hyderabad-based bike pooling and taxi startup Rapido, online hotel reservations startup MiStay and logistics IoT startup Tempogo also raised funding. Bengaluru-based Homevista Decor and Furnishing Pvt. Ltd, which runs online furniture and home design services marketplace, HomeLane.com, has acquired online home interiors marketplace Capricoast for Rs 90 crore ($13.8 million). As a part of the deal, Capricoast’s 120-strong team will join HomeLane, while its founder and chief executive Jawad Ayaz will be on the board of directors. Founded in 2014 by Ayaz, Capricoast connects customers with manufacturers and suppliers of kitchen solutions and wardrobes. It provides modular kitchen designs along with online tools to customise and order them.